In Part One of our search for the hottest high end digital cameras, we finished by looking for something to beat one of our favourites, the Olympus XA. That camera was the Ricoh GR, which, like the XA, offered a fixed, wide angle lens in a compact package. We instantly fell in love with its simple, plain, old school looks – no sea of garish chrome here – and felt right at home with the dual control wheels offering SLR-like handling of exposure and focus settings. The nippy start up and optional optical viewfinder was appreciated, and we had no complaints about the image quality and handling – yet a couple of things still grated. The most annoying thing was the need for the camera’s lens to extend whenever you wanted to take a picture, losing precious seconds when a photo opportunity suddenly arose, with the associated whirring noise often attracting unwanted attention. Although the bolt-on optical viewfinder presented a very bright and crisp image, it offered no exposure/focus information, so we constantly had to look down at the LCD screen when shooting in tricky conditions. Fortunately, there were enough manual controls on hand to let us set up a pre-focused ‘street shooting’ mode for quickfire shooting which proved very effective, although nothing can beat a proper optical ‘finder. We’re still using the GR but our current main digital compact has become the Ricoh GX100, which offered the same SLR-like manual controls as the GR, with the addition of a handy super wideangle 24mm-72mm zoom. A cunning attachable electronic viewfinder went some way to solving the problem of presenting exposure information while shooting through the viewfinder, although the image was rather crude compared to an optical viewfinder. It’s still a gloriously versatile camera, offering a great range of pro-minded features like user-customisable menus, image stabilisation and RAW shooting, and we’ve been delighted with both the handling and output. 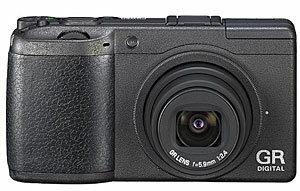 The GX100 was recently superceded by the Ricoh GX200 – check out our full review here – but with only a few relatively minor upgrades on offer, we couldn’t justify shelling out for the new version, even if we would certainly recommend it to new users. Looking around at the current crop of high end digital compacts, both the Canon G10 and the Panasonic Lumix LX3 have been picking up good user reviews. 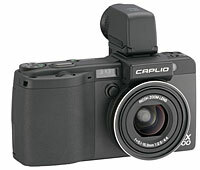 The Canon G10 is the 3rd generation of the rather chunky body style first seen with the G7, and the latest release adds a 28mm wide angle lens, improved grip and the usual excellent control layout and handling with a frankly bonkers 14.7MP sensor wedged inside. It’s a mighty fine camera for photo enthusiasts and we *love* the traditional ISO dial but you’d need MC Hammer’s wardrobe to fit the thing into your pocket – it’s a monster alright, so not for us. 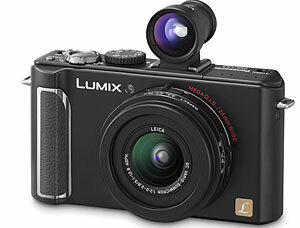 The Panasonic LX3 looks a much more tempting package to our eyes, offering a ton of top notch features in a far more compact body, with the company sensibly steering clear of the ‘pack in more pixels’ race, offering 10MP on a custom sensor. The lens is the real standout here – a sensationally fast f2.0-f2.8 24mm-60mm wide angle job, backed by Panasonic’s great joystick control system and a hot shoe supporting flash sync up to 1/2000. The camera can produce some truly stellar results too; check out the stunning examples in this Panasonic LX3 review Nikon’s intriguing new Coolpix P6000 also looks an interesting proposition, with a 13.5MP sensor, 28-112mm lens (at a slower f2.7 – 5.9), loads of high end features and even built in GPS for geotagging and a built in LAN port for swift image transfer. Although all of these cameras offer performance to at least match the Ricoh RX200, they all suffer from having relatively tiny sensors squeezed inside – which translates into more noise in low light situations. Although we’re itching to replace our long serving Ricoh GX100, none of the current crop would really offer enough of a substantial upgrade to justify the extra dosh (although it has to be said that the Lumix LX3 is continuing to create some serious palpitations in our wallet department). 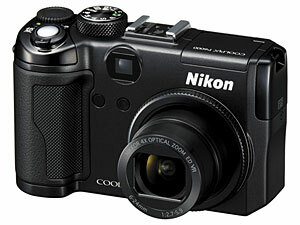 The final instalment, to help you choose the best high end digital camera this Christmas.